Ok, maybe the turtle doesn't look giant in this picture, but the shell was at least a foot long. 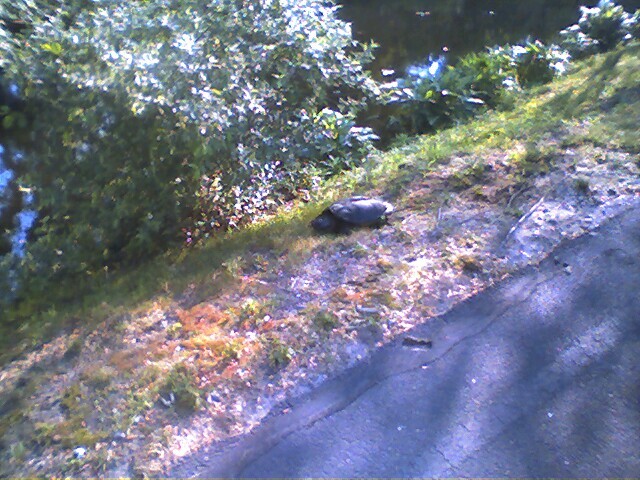 At the entrance to my condo there is a small canal, and this morning on the bank there were two quite large turtles. I've mostly seen a lot of small box turtles in this canal, but these two turtles were at least two or three times bigger than a normal box turtle. I initially thought they might be snapping turtles since they can get quite large, but the shell didn't look like one - the underside was orangish. Unfortunately, I again did not have my real camera with me and had to use my mobile phone camera. To make matters worse, I also accidently deleted a closer up picture that showed more detail of the turtle. Oh well.